We didn’t have e-mail, but we did have a mailing list, and would create cut & paste flyers by hand, make copies, and mail out about 150 every month or so to our fans. This one is 1986. 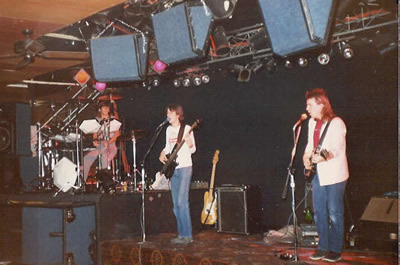 Mark Rex left the band in February 1986, and The Fascinators continued as a four-piece. The Fascinators evolved out of The Chems around 1984-85. 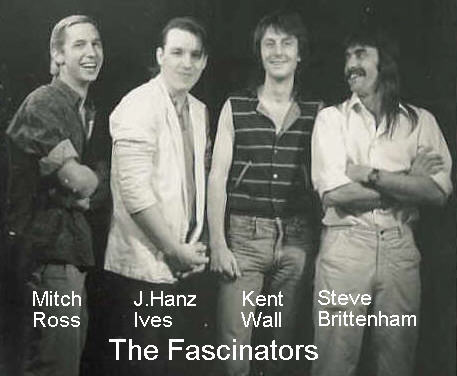 The Fascinators were J.Hanz Ives (guitar/vocals), Kent Wall (bass/vocals), Mitch Ross (drums/percussion/vocals), Mark Rex (vocals), and Billy Cooper (keyboards/vocals). 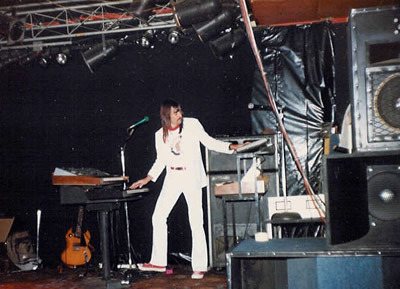 Billy Cooper left the band in 1985 and was replaced by Steve Brittenham (keyboards/vocals). 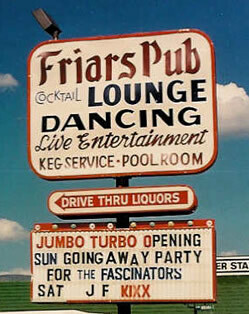 The final show, May 17, 1987 at Friar’s Pub. Jumbo Turbo opened the show for us, and each band played a long set of all original music, which was something special. 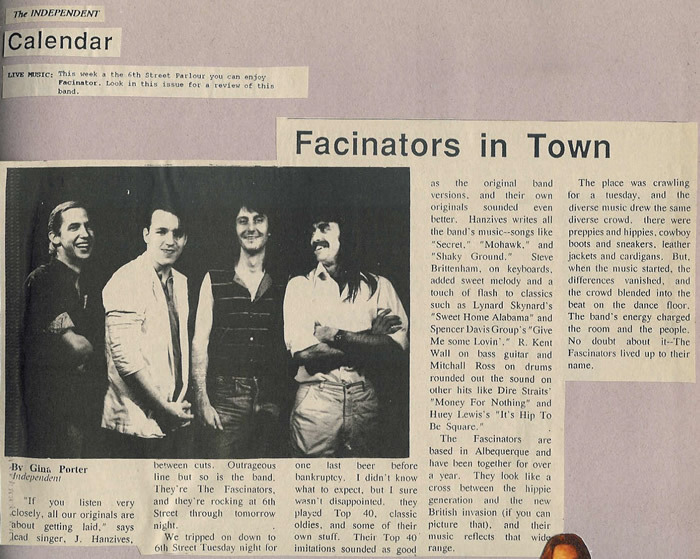 Back in the ‘80s most club owners frowned on bands playing their own material. 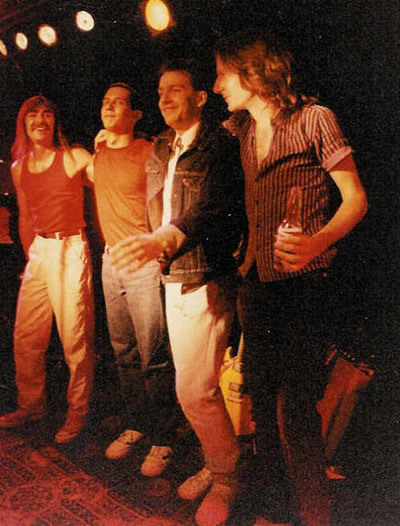 We managed to get away with about a third of our show original music all the time, wherever we played. Phil Appelbaum and John Cline did a great job of capturing this last show on video. 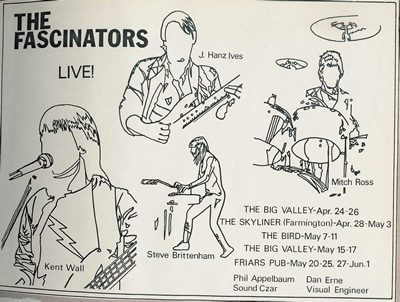 They gained a reputation for presiding over the last rites for many Albuquerque bands. 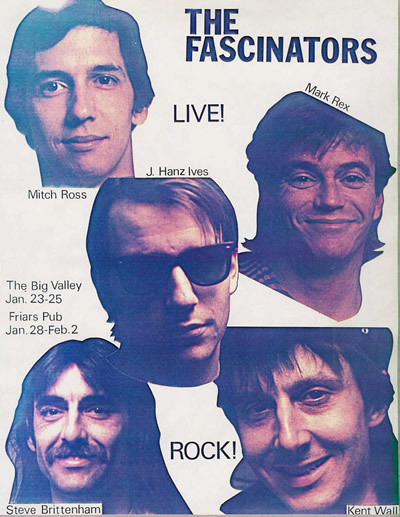 From the time I joined in 1985, we played 354 shows, including one 19-nights-in-a-row stint, 13 at Friar’s Pub, and then 6 more at Friar’s North.